Because she was trying to get to me. she settled for second best. Um…wow. Not only did this say a lot to me about my personal affection for my laptop, evidenced by how often I am staring into its wide-open mouth letting it all but swallow me whole, but it stopped me in my tracks about my walk with God. How many times do we do this? Go after a substitute and settle for something, stopping just short of the Real Deal? That entertainment I want to fill my life with? Yeah, fun for a while, and nothing inherently wrong with wanting to be amused, but at the end of the day, it leaves me coming up pretty empty. That vice that seems so innocent and, after all, “in moderation”? Doesn’t fill that space. That career from which we strive to get our self-worth? Not a bad thing by itself, but it doesn’t fully deliver. That relationship that seems so fulfilling, so perfect, but after the honeymoon phase, we discover we are imperfect people? Yeah, not going to complete us. That obsession we have about exercising/running/hitting the gym (that does not in any way describe me)? Great for health and fitness but not the solution to our soul hunger. That preoccupation we have with our expectations of ourselves, others, etc.? Oh, expectations—hear that pedestal come crashing down! Now please hear me: Some of these things are very worthy pursuits. It’s good to have fun, interact with others, and choose healthy pastimes. But do they preoccupy us to the extent that we keep chasing the fix they falsely promise? Do we try to fill our spiritual hunger—our built-in God need—with physical, social, and emotional experiences? What gain has the worker from his toil? I have seen the business that God has given to the children of man to be busy with. He has made everything beautiful in its time. Also, he has put eternity into man’s heart, yet so that he cannot find out what God has done from the beginning to the end (emphasis mine). where faith may take us. I’ve interacted with God for a long time, and yet, I still often get hung up on the tangible, the distractions, and the obstacle that seems to be in my way. I convince myself that somehow that must be easier than just talking to Him. Whether you know Him yet or not, what is stopping you from believing there’s something more beyond what is right in front of you? It isn’t about striving. Jesus says his yoke is easy and light. It’s about entering in and engaging with a holy God. It’s about accepting His invitation. Why settle when we can interact with God, taking a leap of faith to see what is beyond, which adventures await, and where faith may take us? whoa. that one hit home! I’m still processing some of this myself, Yolanda. It takes so very little to take my eyes off my Savior. What a great reminder! I love how God can use even our pets to get our attention! Nice to meet you on Mom 2 Mom Monday. Thanks for coming by, Meredith! I appreciate your comment! Blessings! Awww great reminder. I love your puppies! I love how the ordinary can inspire us about the extraordinary, the lessons just waiting for us to be still enough to see them. 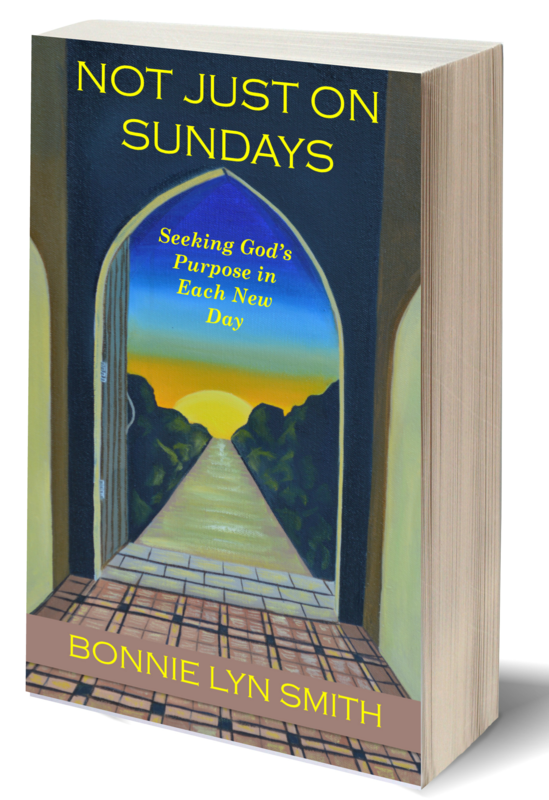 What a great reminder Bonnie! Thanks, Amy. I love looking at small moments! Thank you for stopping by “Espressos of Faith”! Blessings! Oh this speaks to my heart in a powerful way, Bonnie. Thank you for this reminder… I needed it. SO often, I pursue the laptop, the ‘to do list’ in place of God, when clearly I need to link hearts with my Leader and my Ultimate fulfillment first…. He’s begging for our attention. Thanks, TheMomCafe! 🙂 It’s amazing how many things pop up on my way to grab my Bible study book even, let alone worship, etc. Suddenly everything else looks more interesting. I settle for less way too often. Thanks for coming by! 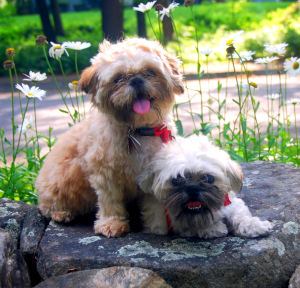 Oh Samson and Delilah are adorable! Thank you for this post I really enjoyed reading it. It is so easy to get caught up in other things but even Paul says he disciplined his body and kept it under control. So we must not let our fleshly desires run away with us we need to force it into Spiritual habits that glorify God and strengthen our relationship with Him. Thanks, Tamryn! I appreciate you stopping by “Espressos of Faith”! Your comment spoke to something for me, and I wanted you to know that. You wrote a devotional just in a small comment, and I really took it in! Blessings! Such cuties they are! We are SO much like dogs! Dogs have this insatiable appetite for food (at least Beagles do!). Their “hunger” drives them to extraordinary means to find food to satisfy that “hole” in their belly. We humans are like that too. We sometimes go to great lengths to “fill” our hearts & souls with “things.” Things might fill us up in the short term, but certainly do not substain us over the long term. I have searched much of my life to fill my hunger. It has truly been a struggle. I continue on my journey. With age comes wisdom to know “things” are not going to do it for me. So, at this fork in the road, I am headed in a different direction with the hope of finding what I have always been looking for, inner peace & fulfillment. Deb….I love your comments. There is so much to be learned watching God’s critters! I pray you find that inner peace and fulfillment. It’s definitely a journey. I still fall for the “things” trap and settle for second best. 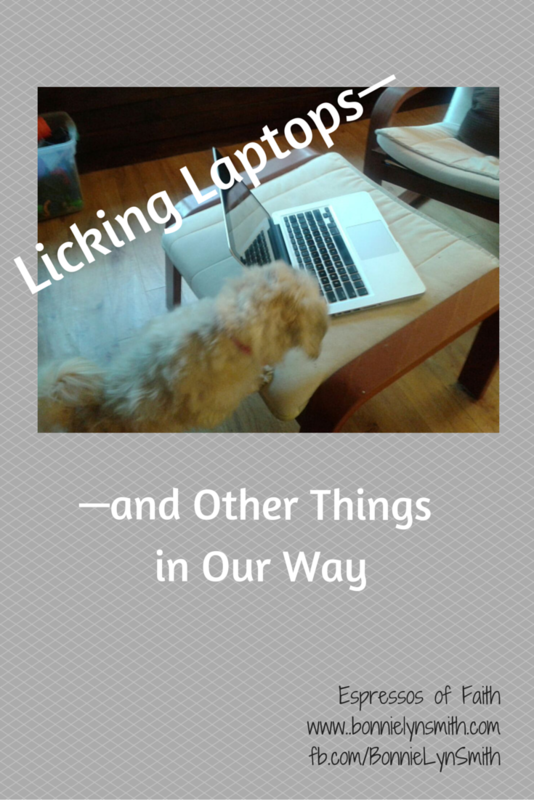 I still lick laptops, but I’m catching myself sooner. So glad to have you on the journey with me! Life is better for it! I draw strength from reading what you wrote. Thank you! What adorable dogs!! Oh how true that we can settle for second best in our relationship with Jesus. it happens when we take our eyes off of Him and settle them on the things of the world. Great post! Stopping in from #GraceTruth. Hi, Leah. Thank you for stopping by “Espressos of Faith”! I really appreciate your encouraging comments! Blessings!